Welkum tu tha ORX page. Err, WEllkom. Well Come In Arr! 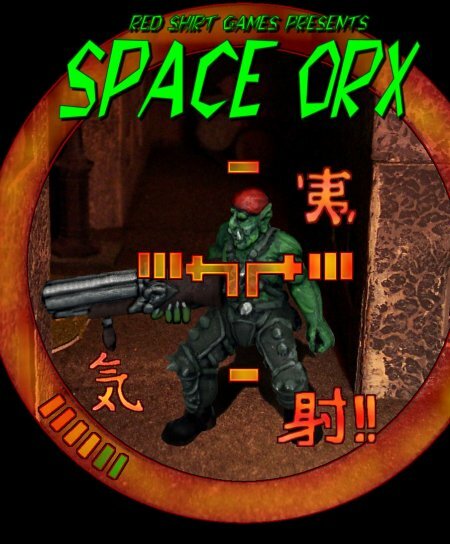 Space Orx is our second supplement for Injurius Games. Our first supplement, Meck Wars, raised the complexity of the rules by introducing a new form of Gladiator that was sleek, modular and unpredictable. This supplement brings the bar way, way down, in more ways than one: the Orx are rude, crude and easy to operate. "Arrgh! Move fast, keep some cover, and keep shooting! Them humans are too smart fer theirs own good! They fall down when they get hurt. They are week and puni, and deserve to be beet like route vegetables." They are faster on the ground than the Humans, have lots of hit points and powerful yet low-tech weapons. Like all of our products, you can download the Unit Record Sheets, counters and card deck directly from our downloads page. 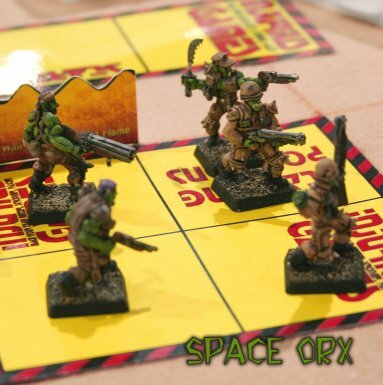 Orx have a standard IG 5-member squad, but they have two leaders, the Sarge and the Elltee. The one shown at left is no leader: he is the mighty Chain Gunner. His Gatling Laser brings repeat energy firepower to the game, and is much feared by the puny Human Gladiators. Who goes into battle without powered armor? Orx! Orx! Orx! With little armor, these big guys have to hit first and hit hard. Luckily, his lack of armor is of little consequence. Orx feel little pain and shrug off injury as a matter of course. Many a match has been won by Orx that were clinically dead, but still fighting. Because their culture is so lawful, their leaders have little trouble combining combat and leadership. Orx almost never lack for Command Points, and their size and strength make them naturals in melee. "All right boyz! Get out there and move fast! Arrgh, we're gonna kick them like da girls dey are!" The minis are a first for Red Shirt Games. 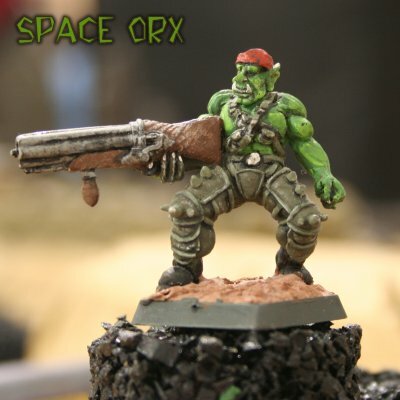 They are cast in pewter by RAFM, a Canadian miniatures manufacturer that does much more than Orx. Because they are more expensive, you only get one squad per pack compared to the Humans and Mecks, which come two squads to a pack. Visit our Store to purchase Orx packs and Orx books. Compare the price of these minis to those of other companies... You get a blister with 5 heavy and well-sculpted minis for, well, check out the price on the Store page. Then go to the competition. The book contains 40 pages of Orx background, rules, weapons, Skilz, Stuff, Unit Record Sheets and Quick Reference. These guys are off the wall, and their Skilz and Stuff reflect that: for example, who else eats Brain Candy (you have to be stupid to eat Brain Candy! ), or drinks G.I. Coffee (this stuff makes Human coffee look like a hot milk toddy!)? And only Orx have the Tag Team Skill (gang up on a hapless opponent in melee! ), and Athletics (Orx make physical fitness their priority). Copyright © 2006 - Red Shirt Games - All Rights Reserved.